Midnight Shift's music is a combination of blues, 50's rock, rockabilly and rhythm and blues. 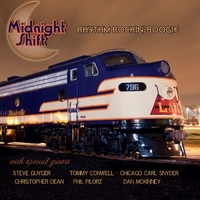 Rhythm Rockin' Boogie, by Midnight Shift is a musical journey that travels the roads of blues, 50's rock, rockabilly, and rhythm and blues. There are 13 originals and five well chosen covers from the band's live shows. The new CD also contains a little help from their good friends Steve Guyger, Tommy Conwell, Chicago Carl Snyder, Christopher Dean, Phil Pilorz and Dan McKinney. A great mix and so well produced. Electrifying truck drivin' tunes with some rockabilly and Texas tornadoes along with throbbing Slim Harpo and Lazy Lester harp. I mean it just wants you to shake it and dance.